This image, created with data from the Cassini mission, shows where particles smaller than 5 centimeters are rare (purple) and common (green), and where particles smaller than 1 centimeter are common (blue). As particles race around Saturn at breakneck speeds, their jostling and crashing may look random and haphazard — but a new mathematical theory brings a simple kind of order to the chaos that will help reveal more about rings across the universe. 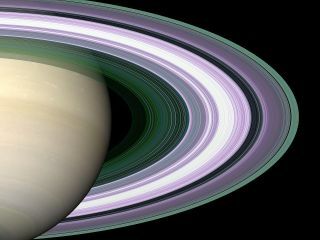 A group of physicists, mathematicians and astronomers has more rigorously explained a longstanding mystery of Saturn's rings: why the distribution of different particle sizes, ranging from inches to more than 30 feet (10 meters) across, follows a very simple ratio. Their model also suggests why very large bodies in the rings never last long. An artist's depiction of a close-up view of Saturn's ring particles. The clumps are continually forming and breaking apart. "The law follows from a 1-centimeter-sized (0.4 inches) particle to house-sized," said Nikolai Brilliantov, a mathematician at the University of Leicester in England and lead author of the new study. "This is mathematically quite beautiful, but [we had] no idea why it happens. Now, we understand that it's perfectly correct, and we know why, and can prove that there is a very universal mechanism behind these particular features." Since the 1980s, researchers have noticed a strict ratio in the sizes of particles in Saturn's rings — that it roughly followed an "inverse cube law." For instance, a particle two times larger than another will be eight times less common, and a particle three times larger will be 27 times less common. The new mathematical model starts with merging and fracturing particles, and finds that the distribution would be very similar to this rule of 3 — between 2.75 and 3.5. And it would have that same drop-off with very few particles above a certain size. "Usually, astrophysicists try to solve their problems, but they are not equipped with the new [mathematical] tools," Brilliantov said. Over the course of seven years, the researchers studied the mechanical properties of ice, collisions and fragmentation to work into their model of how granules behave, verifying that the ratio can emerge out of real-world starting rules through calculations on a Moscow supercomputer. And the rule is even broader than they thought when starting out: Only two years ago, researchers found that asteroids have rings, too. And the ringed asteroids Chariklo and Chiron fit Saturn's mold, said Paul Krapivsky, a statistical physicist at Boston University and a co-author of the study. The asteroids with measured rings are much, much smaller than Saturn, Krapivsky told Space.com. But yet "they still have similar rings," he said. "And not just similar rings — they have similar distributions. It's quite universal." How well the rule applies to edge cases, where the rings are very different from Saturn's, remains to be seen. "It's an interesting theoretical work," said Shawn Brooks, a planetary scientist who works on NASA's Cassini mission to Saturn and researches Saturn's rings but was not involved with this study. However, Brooks said the model's physics might not apply to systems with an excessive number of collisions or very few collisions, and thus further observational research would be needed to see when those systems would hold to the model. As it is verified in more cases, the model can teach researchers about planets and the asteroids that the rings surround. "Now we know how the rings must be constructed," Brilliantov told Space.com. "Suppose we discover new rings, of some planet — just [by] measuring the distribution of particle size of the ring, we can say whether these rings are young or whether they've experienced some catastrophic impact in the reasonable past. If they're in the form of inverse cube … nothing happened for the last 10,000 years." Also, by looking at the maximum particle size, researchers will be able to learn more about the substances from which the rings formed. "It is important to study the ring particle-size distribution and how it varies with location," Jeff Cuzzi, the rings-and-dust interdisciplinary scientist for the Cassini mission who was also not involved in the study, wrote in an email. "This can tell us about the vigor of the local ring dynamics." Cuzzi said this work confirms previous research on how Saturn's rings form, and describes it in a more general mathematical sense. "The general conclusion of all work to date is that the particles are loose aggregates, not solid icebergs, and that the size distributions we see today are not primordial but are highly evolved and re-evolved by local dynamics," he said. As the tricky process of measuring far-off rings is repeated for more planets and asteroids, the research team will have more and more situations to feed into the model. Saturn's rings have reached a balanced, steady state, but other rings in the universe may not be so well-established: Brilliantov says the next step would be to delve into how rings evolve over time to settle into a balance. "In our solar system, there are plenty of rings which are not explored," Brilliantov said. "We know that Neptune has planetary rings; asteroids have rings. We know that they do exist, but nothing is known about the distribution of particle size … If we have enough information, we can apply a more complicated, more beautiful, more comprehensive theory for these systems. There are a lot of things to do." The research is detailed in the Aug. 4 issue of the Proceedings of the National Academy of Sciences.